I have uncovered what I believe to be a remarkable similarity between the search for human meaning in life and the search for a unified understanding of free will. The pursuit of intrinsic meaning in the universe may seem highly dissimilar to a conversation about free will, but it turns out to be remarkably similar. In both cases we have a hard, reductionist truth that waits for us in the dark. For meaning, that truth is that there is no true meaning that’s there to be discovered. There is only what we bring ourselves. In free will the hard truth is that whether you have a deterministic or random universe (or some combination thereof) neither gives humans the ability to have done otherwise for any decisions they have made. And because we could not have done otherwise, we cannot be held responsible for our decisions. That is Absolute Free Will, and it seems clearly impossible based on everything we know of the universe. There is another type of free will that we definitely have, and that’s Practical Free Will. Practical Free Will is the ability for an individual to experience having options, considering the outcomes of those options within the context of their value system, and then experience making a choice from among them based on what they want to happen. Practical Free Will, in other words, is the experience of having free will. And I, as an incompatibilist who believes Absolute Free Will is impossible, accepts this type of free will as obvious, valuable, and…well, practical. A man chops down some trees and builds a house with a fireplace to survive the winter cold. Why are the trees gone? Why is there a house now? We cannot find the answers in the chemistry and physics. We have to move from physics and chemistry to biology before we can make sense of what has happened and why. The man’s own need to survive is the reason. The man’s own muscles chopped down the trees. The man’s own mind conceived the house and made countless decision as to its design and construction as he built it. Without the purpose that came with the man, the trees would still be there, and there would be no house. No one can dispute this. And if the trees came from the small apple orchard in your back yard that you were tending to support your family, you would hold that man responsible for your loss. I think this elegantly captures practical human life and a type of truth that it represents. We are humans, living in a human world, with all the experiences and constraints that come with that. And there is no escape from this reality. If you’re a mindful incompatibilist you tend to control how you experience these feelings, i.e., you aren’t likely to feel hatred or disgust the same way that a believer in libertarian free will does. But that’s not the point. The point is that we as incompatibilists (people who don’t believe free will is possible) still have these feelings. Every day. All day long. It’s natural. It’s normal. It’s human. So, that’s our problem. As people who both honor the reductionist truth that we aren’t actually making choices, and simultaneously know that we cannot function in the world without having thoughts and actions that reflect a belief in free choice, we must come to a similar conclusion to that Camus’ did with meaning. Neither meaning nor free will can be solved satisfactorily to humans because the true answers are not compatible with human experience. We cannot live our daily lives as if there is no meaning in the universe. We cannot generate our own and pretend it’s intrinsic. So all we can do is choose a path that is in accordance with our moral framework, that grants some measure of fulfillment, and move forward. And it is the same with free will. We cannot live our lives as if people do not make choices. Not really. Not if we’re being honest with ourselves. If we did, we’d never blame or praise anyone for any action they’ve taken. We’d treat those who treat us badly just the same as those who treat us poorly, since neither had responsibility for their actions. But we also shouldn’t over-subscribe to the ideology of “deserving” this or that on the grounds of the actions, because we do actually know that people don’t have choice. So we must walk this ledge without falling on either side. And that’s precisely what Camus’ recommended with meaning. Never give in to the false meaning frameworks. Never believe they are real. But live within them to the degree that they satisfy you so that you don’t drop into despair. Live on despite the bleakness of reality—in beautiful defiance of it. I say that we are ok to embrace certain structures and frameworks, whether traditional or created on your own, as long as they are not harmful and as long as people know they are false. I believe Camus warned against believing these systems are true, not against using them. Ultimately, we are humans living in a human world. Everything we experience is a subjective distortion of the universe’s bleak reality. We have a structure given to us by evolution, and combined with our strange and limited interfaces to the natural world they make up our unique, human set of values and goals. Love, respect, responsibility, etc. We cannot simply choose to stop wanting or believing in these things, even if our intellects have shown them to be illusions crafted by evolution to compel us to action. So now we face the truth that creates so many of these tensions: There is a vast difference between human experience and the fundamental nature of the universe. This is true for meaning. It’s true for love. And it’s true for free will and moral responsibility as well. This extraordinary Absurdist Chasm between our daily lives and reality will be uncrossable until we can fundamentally alter the programming given to us by evolution. Our intellects can see the gap, and we can measure it and discuss it, but we cannot truly bridge both sides while in our current human form. 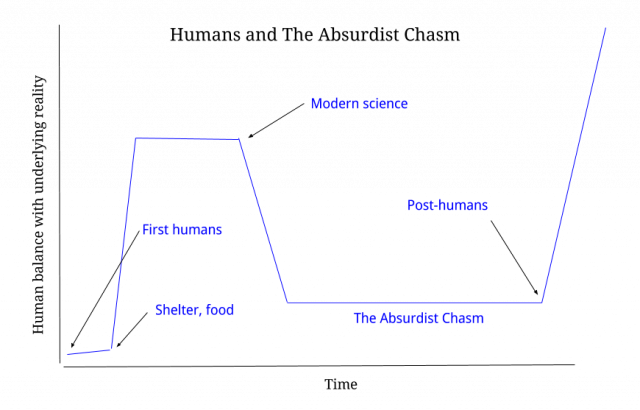 As we see in the diagram, the Absurdist Chasm is the gap between our primitive selves gaining knowledge about the underlying nature of reality and our evolution into a form that can simultaneously behave at the human and fundamental levels. Absurdism isn’t the bridge, but it’s the next best thing. It’s the tool that allows us to honestly see both sides (human experience and reality) and to live within the chasm without losing either our integrity or our sanity. Whenever we find fundamental problems with something we cherish as humans, the answer is likely to be Absurdist. Love is chemical and can be manufactured in a lab? Absurdism. There’s no intrinsic meaning in the universe? Absurdism. There’s no basis for moral responsibility in reality? Absurdism. As we see from these three examples, the free will debate is not unique in this. We will find this wherever a core human need (manufactured by evolution) collides with the harshness of reality, and the concept of moral responsibility is simply one case in point. Both compatibilism and incompatibilism fail to recognize the Absurdist Chasm between human experience and reality, and they both fall to their deaths in that chasm, leaving us with unsatisfactory answers. This is why the debate has continued for centuries. The solution is to identify the Absurdist Chasm and accept it as the actual problem, and to use Absurdism to live within it until we can unify our experience and reality. Both compatibilism and incompatibility are ultimately flawed, each for a different reason. Compatibilism is flawed because it provides no credible path from determinism to moral responsibility. Incompatibilism is flawed because it provides no practical path from accepting its core belief to living an everyday human life. Both explanations fall into something called the Absurdist Chasm, which is the fundamental disconnect between human experience and reality. Moral responsibility isn’t the only problem that falls into this chasm. It’s joined by other fundamental human values that were give to us by evolution, which include Love and Meaning. Camus’ Absurdism is the only tool we have for navigating within the chasm, and we will need to use it until we can unify human experience and the fundamental nature of the universe. I have been pursuing this solution for almost a decade, and my desire to do so is most acutely brought on by hearing Sam Harris and Dan Dennett discuss free will. In their last discussion I realized very clearly that both sides were flawed, and that a solution was required. The Absurdist Chasm isn’t a full solution, of course, but rather just an explanation for why we haven’t been able to solve the problem, and a clear identification of the fact that Camus’ method for dealing with a lack of intrinsic meaning and free will share something fundamental: they’re both rooted in a deep limitation of human experience, and thus will not be solved until we can free ourselves from it as a race.